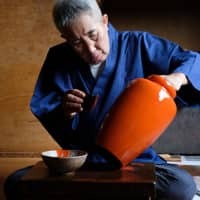 In the window-lit corner of his family studio, Toshifumi Tanioka kneels, pouring thick orange lacquer into a bowl covered by white sheets of thin yoshinogami washi paper. Lifting the washi, he twists the ends, transforming the filter paper into a glistening orange cocoon. 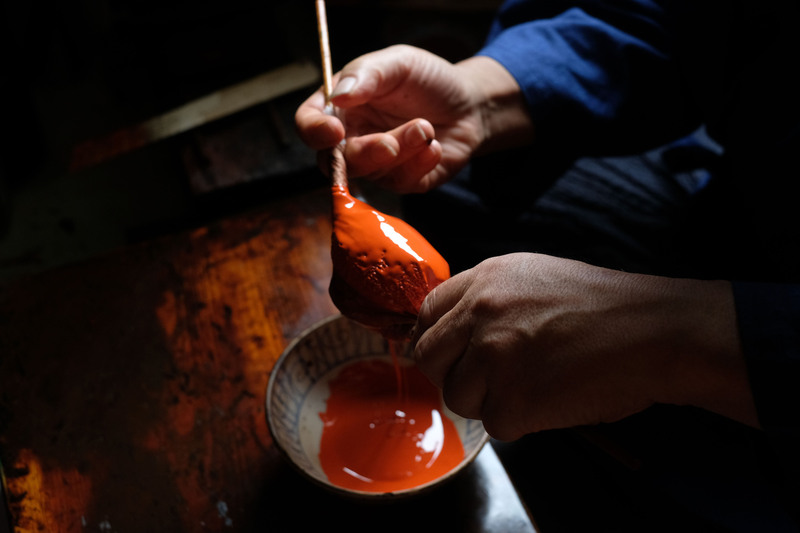 As the lacquer seeps through, a brilliant vermillion thread fills the bowl beneath — a single, beautiful step in the centuries-old technique used to make Kishu lacquerware, produced in Kuroe, Wakayama Prefecture. Along with Aizu region in Fukushima Prefecture and Yamanaka (now part of Kaga) and Wajima in Ishikawa Prefecture, Kuroe is considered one of Japan’s great lacquerware producing regions. During the Muromachi Period (1392-1573), woodworkers began moving to Kuroe to make shibuji-wan (bowls with a base coat of persimmon juice and lampblack) from the plentiful hinoki (Japanese cypress) in what was then known as the Kishu Domain. In the 16th century, artisans from Negoro-ji Temple in Iwade fled warlord Toyotomi Hideyoshi’s armies, taking with them the skills to make lacquered tables, trays, cabinets and more. 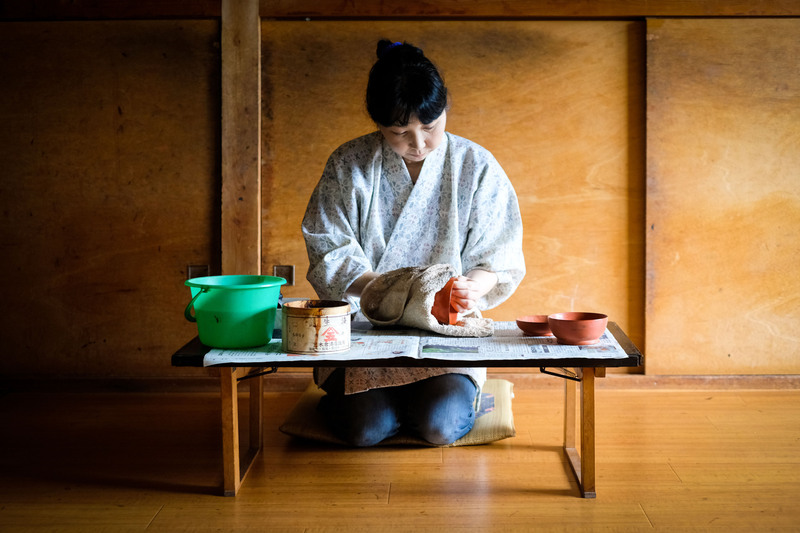 Over the years, highly skilled artisans would continue to be drawn to Wakayama, further improving techniques. The Tanioka family’s workshop, Tanioka Shitsugei, was founded in 1883. 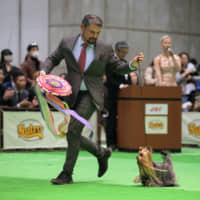 Toshifumi Tanioka, and his daughter Kumiko Tanioka, are two of only three recognized traditional craftspeople of Kishu lacquerware technique left in Kuroe district. As late as the 1970s, there were still hundreds of families employed in lacquerware, but in the ’80s the industry collapsed. Without new apprentices and woodworkers to source wood from the nearby forests and carve new vessels, it’s feared the craft may soon be lost entirely. The UNESCO designation of World Heritage status on the majority of the Kumano Kodo trail also means that much of the forest in Wakayama is now protected. This had the unintended consequence of cutting off Kishu lacquer makers from their local supply of wood. In a storage room filled with old tools and lacquer tree trunks used for display, Kumiko shows me shelves stocked with unlacquered wooden vessels, all imported from other areas of Japan. Some are over 20 years old, an indicator of their increasing scarcity in the region. “Even if we were still able to source local wood, Kuroe no longer has woodworkers who are able to carve and shape it. It’s one of the reasons for (the production of) so many plastic items,” she says. Plastics became a mainstay of Japanese lacquerware in the 1940s and 1950s. What were once semi-precious items became ever cheaper gifts for weddings and special occasions. An official from the Kishu Lacquerware Cooperative Union quipped that these items became so ubiquitous, housewives would be buried in an avalanche of plastic serving trays when they opened their cupboards. 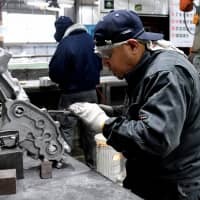 An exaggeration, but one that illustrates the plastic-fueled mass production of the 20th century that rendered so many highly skilled industries obsolete. It was not the first time the lacquerware industry had faced a major change. In the Meiji Era (1868-1912), the market for Kishu lacquerware grew overseas. By 1883, nearly 60 percent of Japan’s lacquerware exports were produced in the region. It was during this period that carving the lacquer surface and then inlaying gold leaf or powder, a technique known as chinkin, became popular. 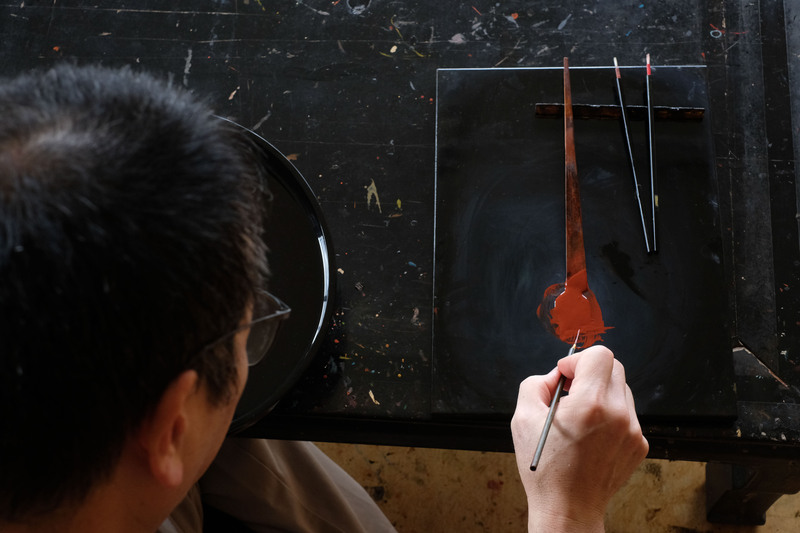 Katsuhiko Hayashi is an expert in both chinkin and maki-e, another technique involving using lacquer to paint the surface of an item with intricate motifs, such as flowers and delicate grasses. 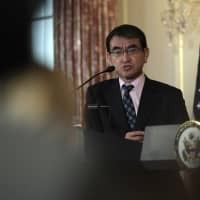 His skill has earned him the honor of lacquering the sacred asagutsu wooden shoes worn by the Shinto priests of the Grand Shrines of Ise, Japan’s holiest place. Hayashi, too, laments the fact that plastic is such a common material for the items upon which he paints precious lacquer and real gold dust. 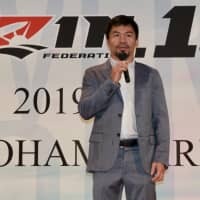 “It’s not ideal, but that’s what we have to work with. The quality of the lacquer work is unaffected. But of course, it would be wonderful to use completely natural materials to match the beauty,” he says. 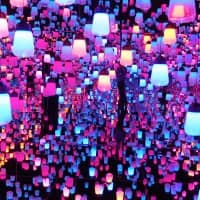 While traditional artisans like the Tanioka family and Hayashi have attempted to maintain the time-honored methods and techniques, others have decided to use modern technology to produce Kishu lacquerware products. Mitsufumi Machida, 67, and his son, Tomoya Machida, 30, use airbrushes and other techniques to rapidly and more evenly paint the surfaces of a wide array of items. On their factory floor, Tomoya Machida affixes wastepaper baskets to a spinning lathe and coats the surface with shimmering layer of gold and black. The entire process takes only a few seconds. The most profitable items the small factory produces are lacquered trash bins, serving trays and temples for eyeglasses. 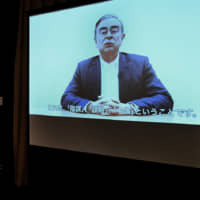 The elder Mitsufumi says globalization has pushed them to modernize. 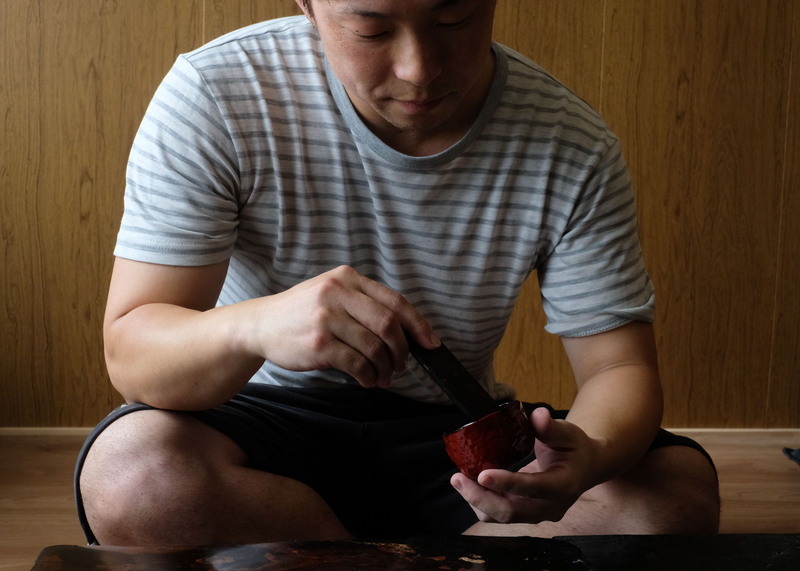 The future of Kishu lacquerware will depend on young artisans such as Tomoya finding the balance between tradition and modernization and adjusting to globalization. But the value of the art lies not only in its beauty or scarcity, but in the sacrifice and commitment of the artisans who dedicate their lives to carrying on a tradition. 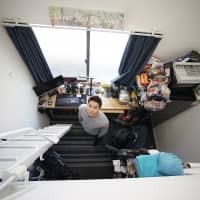 To demonstrate, Tomoya leads us to his private studio below the factory, a simple room where he sometimes sleeps during long shifts at the factory. From the closet, he brings out tools and solvents and arranges them. 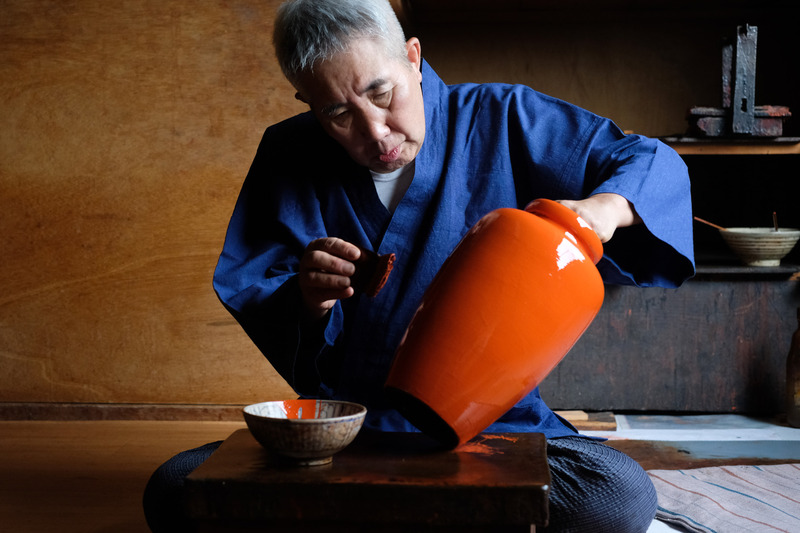 His specialty is lacquering dried mikan (mandarin oranges or tangerines) skins for cups, a collection of which he has on display. As he works, he appears to be a different person from the young man on the factory floor. The Kishu Lacquerware Festival will be held in Kuroe Kawabata Street in Wakayama Prefecture, Nov. 3-4. For more information, visit bit.ly/kishulacquerware.